Discussion in 'Developer Updates' started by News & Announcements, Apr 3, 2015. 8 days after Kickstarter -- and we're already back to work producing new characters and features to bring this vision to life! Lot of "under the surface" stuff happening at ACE this week! Our design team did a full pass on the documentation that details how land ownership (and the fealty trees) work in the Eternal Kingdom, and started to detail out the UI for building and parcel placement. We have to tackle this first, because the parcel system is part of the foundation that will be used for generating unique Campaign Maps, too! Our tech team spent the week making the changes to the combat system -- revisiting the base concepts of movement and targeting, as we discussed last week on the Crowns & Crows and Gold & Glory podcast. On the art side, we're creating swappable equipment for the Knight, concepting Hunger-infected versions of our (also unlocked!) Mounts and catching up on some archetype and building concept art. In fact, another of the archetype concepts is ready for you now: the female Ranger! 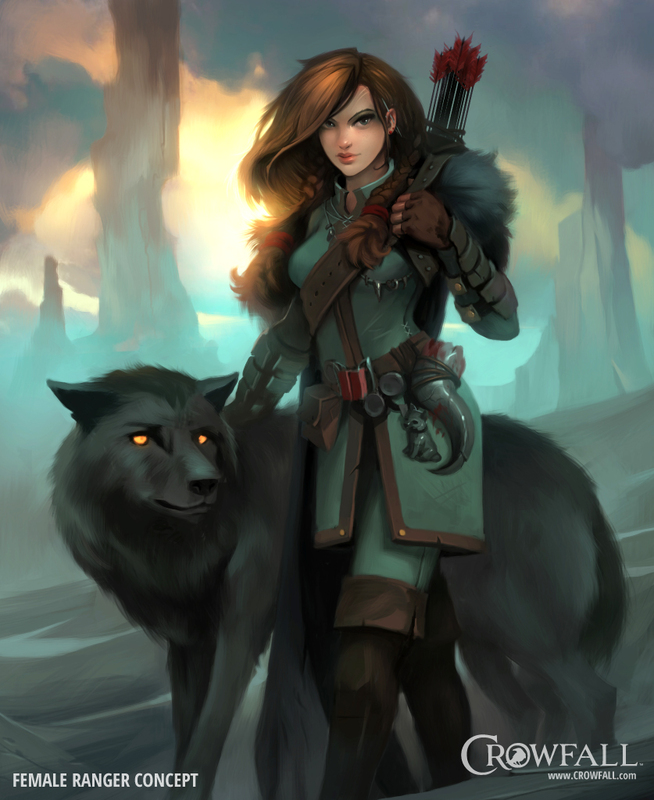 As an added bonus to this one, we've given her a wolf pet -- since we achieved that stretch goal when we crossed the $1.7m line in Kickstarter! ...additionally, we're inviting a few new faces to join our team! In fact, over the next few months you can expect to see a bit of shuffling: a few new people will join us, and a few will move to new positions (like Tully, who recently moved to the CF design team, and Val who replaced him as our new community manager!) and a few will wrap up their contracts and leave. This is normal game development stuff, inevitable as we transition from a project-that-we-hope-will-happen to a project-that-IS-happening! The Crowfall.com website was also updated this week: the front page now displays (quite proudly!) the amazing level of support that you guys showed us during our Kickstarter campaign... and it shows our next stretch goal (Hire a Graphics Progammer, at $1.85 million)! Even though our Kickstarter is over, we still love adding new Crows to our community. Every new pledge makes the game better and the community stronger. We've had a lot of requests to allow package upgrades, too -- our website doesn't support it, yet, but we have plans in the works to make it possible. It's coming, so stay tuned! As always, THANK YOU for being a part of our community, and for continuing to spreading the word about Crowfall! Hell, cant deny that all their classes look rly good.